Some studies have shown that one in 4 people can become more anxious rather than less after taking antidepressants. That’s a 25% chance of worsening what you are trying to eliminate. Many years may pass and people report that still suffer from the effects of the drug-cocktail which doctor have prescribed to treat the side-effects of the original antidepressants they were taken. There are cases (rare according to experts) that people develop suicidal thoughts and the desire to harm themselves after taking antidepressants for the first time. And to our surprise, those that are under 25% seem to be at a higher risk. With this kind of data and statements out there how can young adults, teenagers, and children feel safe using antidepressants against depression? Side effects of using antidepressant are for many people out there the #1 reason for stop using these medications. Seriously, How Antidepressants Can Be Considered As An Alternative to Fight Against Depression? The most famous and most common antidepressants are Effexor, Celexa, Remeron, Paxil, Prozac, and Zoloft. 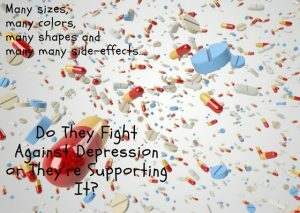 But the thing doesn’t end here because when you try to withdraw antidepressants you may suffer some symptoms too that generally last about a month to years; dizziness, headaches, insomnia, “zap” sensations inside the head, vomiting, more suicidal thoughts, more aggression, being depressive, just to name a few. Antidepressants are not benign drugs and any doctor, friend or person that recommend you using them may not know all the facts and risk pertaining to its use. I hope this is clear to you after educating yourself on this blog post. Some people may say that this actually happens as part of a bigger conspiracy of releasing drugs into the market, creating a dependency on them (a hungry market), and start massively producing them without a further and conclusive test. From there the big guys just have to start counting the profit they’re making every year. Applying some logic to this situation it seems very reasonable and very sinister from the financial perspective of a looking at it as a business. And while at a certain level could be true, most of us cannot prove it. (That’s why it’s been called a conspiracy). Antidepressants aren’t good, try to avoid them as much as you can, a solution proved to bring some nasty side effects and worsening what you want to threat, (depression and anxiety) is not a healthy solution after all. Having a CBT (cognitive behavioral therapy), joining to self-help groups, regular exercise, IPT (Interpersonal therapy), counseling, walks in open nature, taking the sun, getting a massage are some considered alternatives to antidepressants. But more research is needed.